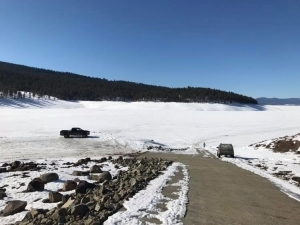 BAKER CITY, Ore. – Boaters and anglers now have improved access to Phillips Reservoir, with the recent completion of the Mason Dam boat ramp. Mason Dam is a popular and heavily used boat launch facility. Phillips Reservoir receives approximately 5,000 boating use days annually. This project was identified in the Oregon State Marine Board’s “Six-Year Plan” as a priority to replace the deteriorating boat ramp. The half-century old boat ramp was part asphalt, part concrete and part gravel/dirt. The ramp was unsafe and difficult to use at nearly all water levels. The recent project replaced the old potholed boat ramp with 430 linear feet of cast in place concrete ramp that improved access and will make the site more usable during low water conditions. Phillips Reservoir provides good fishing for rainbow trout and yellow perch from mid-April through July and again in the fall as the water cools, according to Tim Bailey, district fish biologist for the Oregon Department of Fish and Wildlife. The reservoir also provides good ice fishing for the same species from mid-December through March, according to Bailey. Since 2016, ODFW has stocked the reservoir with trophy-sized rainbows, providing additional opportunity to catch bigger fish. It is scheduled to receive 4,500 trophies this spring from May through June. Mason Dam boat ramp is the first access site that visitors encounter at the reservoir. In addition to the boat ramp, amenities include an accessible vault toilet and parking for vehicles with boat trailers. The Mason Dam boat ramp is the only year-round boat ramp at Phillips Reservoir. The reservoir is typically ice-covered from mid-December through the end of March but the site also offers access for ice fishers during that time. Cost of the project was approximately $275,000, which was paid by several partners, including the Oregon State Marine Board, Oregon Department of Fish and Wildlife through a U.S. Fish and Wildlife Service Sport Fish Restoration grant, and the Wallowa-Whitman National Forest. For more information about boating access and boating regulations, visit http://www.boatoregon.com/map.